pathologic cell type, accounts for more than 95% of prostate cancer cases. ' Much rarer tumor types include small-cell neuroendocrine cancers, sarcomas, and transitional cell carcinomas. tiated grades. ' Gland architecture is examined and then rated on a scale of 1 (well differentiated) to 5 (poorly differentiated). Two different specimens are examined, and the score for each specimen is added. Groupings for total Gleason score are 2 to 4 for well-differentiated, 5 or 6 for moderately differentiated, and 7 to 10 for poorly differentiated tumors. Poorly differentiated tumors grow rapidly (poor prognosis), while well-differentiated tumors grow slowly (better prognosis). ous dissemination. ' Lymph node metastases are more common in patients with large, undifferentiated tumors that invade the seminal vesicles. The pelvic and abdominal lymph node groups are the most common sites of lymph node involvement (Fig. 92-1). Skeletal metastases from hematogenous spread are the most common sites of distant spread. Typically, the bone lesions are osteoblastic or a combination of os-teoblastic and osteolytic. The most common site of bone involvement is the lumbar spine. Other sites of bone involvement include the proximal femurs, pelvis, thoracic spine, ribs, sternum, skull, and humerus. The lung, liver, brain, and adrenal glands are the most common sites of visceral involvement, although these organs usually are not involved initially. About 25% to 35% of patients will have evidence of lymphangitic or nodular pulmonary infiltrates at autopsy. 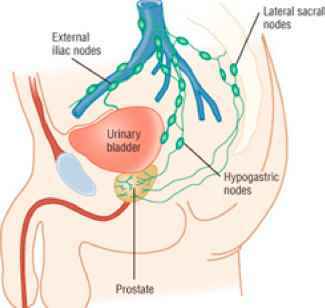 The prostate is rarely a site for metastatic involvement from other solid tumors. thalamic and pituitary level. Prolactin, growth hormone, and estradiol appear to be important accessory regulators for prostatic tissue permeability, receptor binding, and testosterone synthesis. 111, luteinizing hormone; LHRH, luteinizing hormone-releasing hormone. 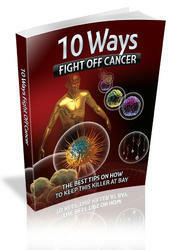 ,JM1noi mechanisms of action, investigational compounds of use. Antlandrogens Rutamide Bicalutamide Niiutamide Cyproterone acetate'5 Progesterones 5-a-reductase inhibition Finasteride Dutasteride"
downregulation of pituitary receptors and a decrease in testosterone production. 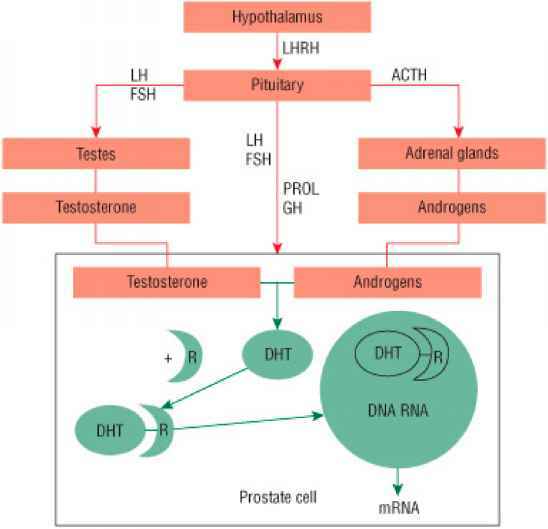 version of testosterone to DHT may be inhibited by 5-a-reductase inhibitors. In advanced stages of the disease, prostate cancer cells may be able to survive and proliferate without the signals normally provided by circulating androgens.29 When this occurs, the tumors are no longer sensitive to therapies that are dependent on androgen blockade. These tumors are often referred to as hormone refractory or androgen independent.